These light, sweet Cranberry White Chocolate Scones can be on your table in 30 minutes and they just require one bowl to make. I love scones. If I had to, I could probably happily live off scones and dumplings and be just fine with that. So, for the holiday season, I thought I might make some Cranberry White Chocolate Scones. They go well with unwrapping presents, morning coffee, and doing your best not to text your ex over the holiday break. For me, a good scone isn’t overly sweet. These Cranberry White Chocolate Scones have some sweetness thanks to the fresh cranberries I used and from the half cup of Private Selection White Chocolate Chips, but for me, the best scones are light, fruit-forward, have a crunchy top, and taste more like biscuits than cupcakes. These are exactly that. They’re sweet and tart with a dry top and a moist center. I think you’ll love them too. When you’re making simple recipes like this, it’s so important to use quality ingredients. For this cranberry white chocolate scone recipe, I used fresh cranberries, delicious white chocolate chips like those from Private Selection, and good butter. I almost always use Simple Truth Organic Unsalted Butter because it’s rich, flavorful, and organic. And, all of these ingredients are available at my local Ralphs, part of the Kroger family of stores! 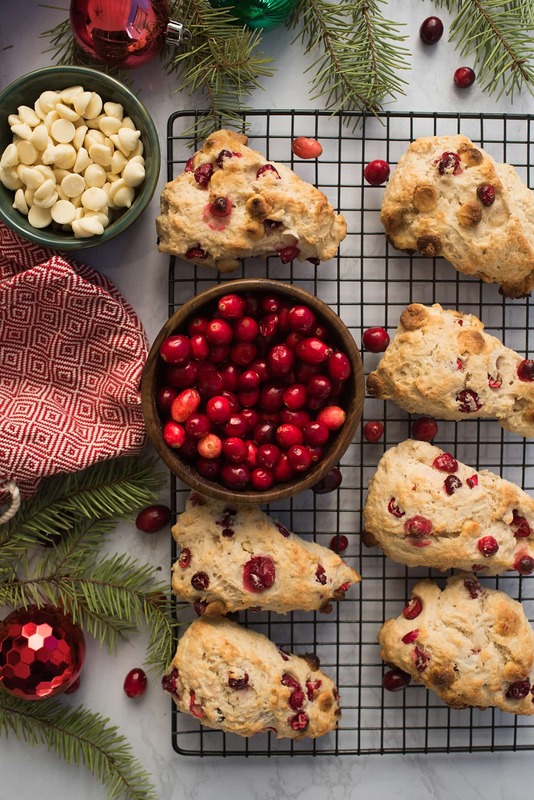 This cranberry white chocolate scone recipe is a 30-minute one-bowl recipe. First, preheat the oven to 400°F. Then, combine all of your dry ingredients (flour, sugar, salt, baking powder, and any spices you’re using) in a large bowl. Cut in the butter using your hands, forks, or a pastry blender. I prefer to use the pastry blender to get things started. I then use my hands to work the rest of the butter into the dough. When you’re done, all of the butter should be coated with flour and you shouldn’t see any large butter chunks. If the butter starts to get warm, stop. Add the buttermilk and vanilla extract and stir this into the dough. I actually use my hands again here because I find it to be less messy, but I also don’t mind getting my hands covered in everything when I’m baking. Work the dough until the buttermilk is just combined. The dough should be slightly sticky. Work in your flavorings. For this scone recipe, that’s the cranberries and white chocolate chips. Do this gently so you don’t continue to work the dough. 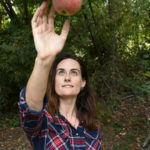 You can do this with a spatula or your hands. Transfer the dough to a cutting board and shape your scone dough into a flat round disc. Cut your disc into 8 equal triangles and place these on a parchment-lined baking sheet. 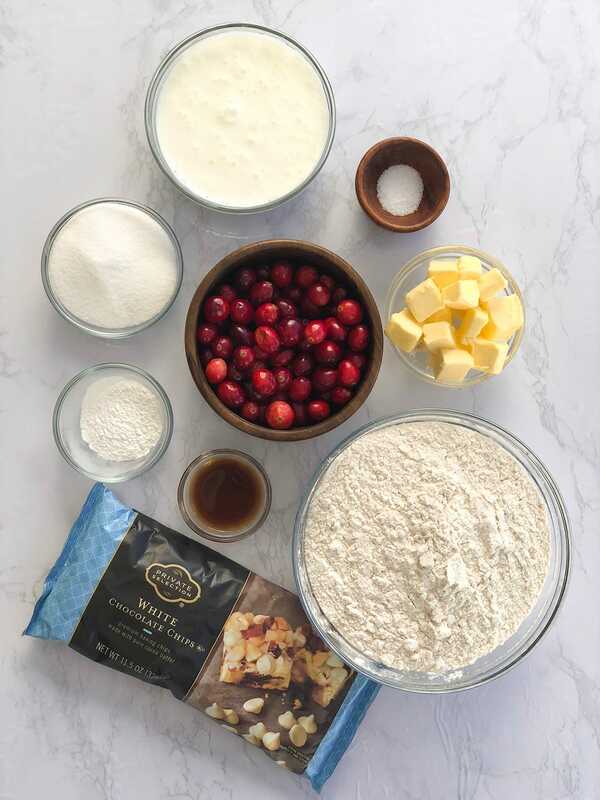 Bake your Cranberry White Chocolate Scones for approximately 15 minutes or until their tops are light golden brown. Place the baking tray on a cooling rack to cool, then enjoy! Use cold butter. I dice the butter first, then place it back in the fridge so it stays cool when I’m preparing the rest of the ingredients. Don’t overwork the batter once you add the buttermilk. You want to make sure the buttermilk is fully mixed in, but overworking the dough will make it tough. The dough should still be sticky when you shape it. Use a hot oven. The high temperature and short cooking time will help them rise high quickly. If you want to use berries to make blackberry scones or strawberry scones, make sure to thoroughly dry them so you don’t add any extra moisture to the scone recipe. 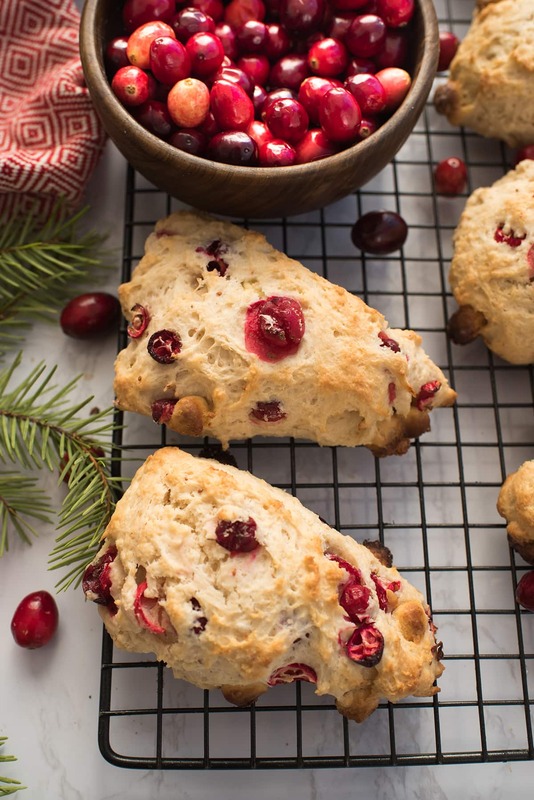 These Cranberry White Chocolate Scones are an easy holiday recipe that require just one bowl. They could be on your table in 30 minutes! Stir flour, sugar, baking powder, salt together in a large bowl. Work butter into flour mixture using knives or a pastry blender. Add the buttermilk and vanilla extract to the flour mixture and mix just until the buttermilk is absorbed. Transfer dough to cutting board and shape into round disc. Slice dough into 8 equal triangles and place on a parchment-lined baking sheet. Bake for 15 minutes or until tops are light golden brown. Remove from oven and place baking sheet on cooling rack. Let cool, then enjoy. 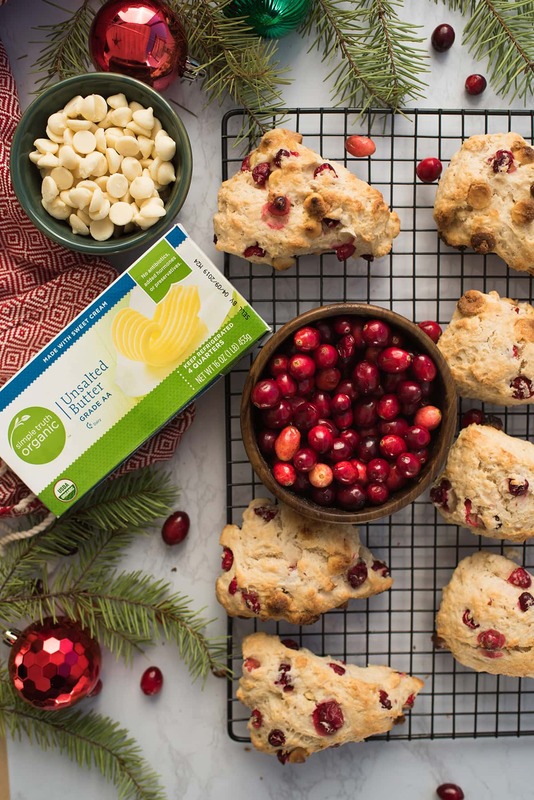 This post has been sponsored by The Kroger Family of Stores, but the Cranberry White Chocolate Scone recipe, scone tips, and opinions are ours. Yum! It has been way too long since I have had a scone. These look delicious. I love the combination of white chocolate and cranberries. You definitely need to try these 🙂 Let us know when you do! I love using cranberries in different recipes this season. Great that you added white chocolate, too. Makes these scones so perfect to pair with my morning coffee! I haven’t had scones in such a long time! This recipe is so perfect for the season – I need to make this for breakfast one day – yum! Scones with coffee are such a treat in the cold weather months. And love this version with cranberries! How you described scones is exactly how I like them!! These sound so easy and perfect for the holidays!